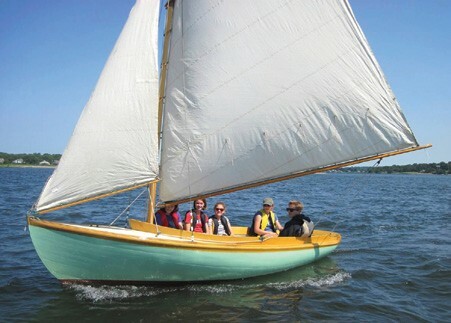 The mission of the Herreshoff Seamanship Program is to teach the art of seamanship and the principles of sailing with an emphasis on excellent instruction, as well as the design, beauty, and unique features of these classic vessels. Our objective is for our students to love sailing and feel a sense of accomplishment. We hope they take away respect for the boats and the elements, as well as self-reliance, responsibility and accountability. It is such a unique opportunity to sail these 100-year-old boats in Bristol Harbor and Narragansett Bay! Youth classes are offered during the week, Monday – Friday, full day or half day. Our students range in age from 7 to 15, with opportunities for our instructor-in-training program for 16 and 17-year-olds. No experience is necessary – all levels are welcome! Students who sign up for a one-week session will learn the basics and get a feel for how a sailboat actually works. Each week we offer on-the-water instruction as well as “chalk talks” on land. Students will learn boat terminology, wind direction, and tacking and jibing. Classroom time is spent learning knots and discussing maneuvers, as well as navigation. Students are grouped according to sailing level and age. There are four students on each boat and one instructor. Students also participate in camp activities such as pirate day or a sail to Hog Island, a museum scavenger hunt, and ultimate Frisbee. Parents have the opportunity to go sailing with their child on Friday afternoons and see what they have learned. There is an awards ceremony and ice cream social each Friday following the parent/child sail. We highly recommend that students sign up for multiple weeks so that they have the opportunity to truly learn the art of sailing and master new skills. As student’s progress, they can earn their “Guppie” (ages 7-9), “Mate” (10+) or “Bosun” certifications. 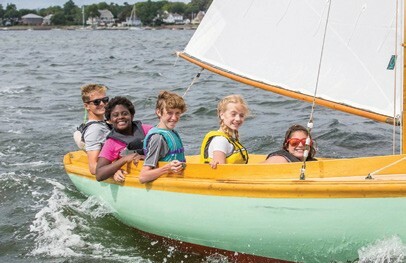 They will build on their skills by learning by topics such as points of sail, spinnakers, mooring and docking, as well as man overboard drills. Special field trips are also scheduled for those who sign up for multiple weeks, which may include a trip to Battleship Cove or other destinations. Scholarship opportunities are available to those who qualify. Applications can be found on our website. Safety is a high priority of the program. All students must wear lifejackets, and instructors carry a VHF radio on every boat. Instructors are all US Sailing Level 1 and CPR/First Aid certified, and there is always a chase boat on the water with the boats. Our adult sailing program also focuses on seamanship and offers classes for every experience level. Beginner and intermediate classes are held twice a week, with instruction time both on the water and in the classroom. The curriculum includes boat handling, tacking and jibing, points of sail, docking, anchoring, sail trim, and much more. Class sizes are small, with a maximum of three students and one instructor per boat. Packages are available with four classes per package – pick the dates you’d like to attend! Advanced classes such as Spinnaker Training and Intro to Racing are also offered on both the 12 ½s and the Sea Sprite 23. Our new Intro to Racing class is held on the Sea Sprite during the Bristol Yacht Club’s Wednesday night races. Participants will learn starts, basic tactics, racing rules, rounding marks, and finishes. It’s a great way for the non-racers to get out on the racecourse and improve their sailing knowledge. Other adult classes of interest are our Wednesday Women’s Night, Couple’s Night & Private Lessons. These classes are taught once a week, and are great for those who would like to get a taste of sailing without having to commit to a full summer on the water. You can attend once or ten times, it’s up to the participant! The women’s classes are a fun night on the water building confidence and skills. Join us afterwards for a glass of wine and light snacks – a great night to sail & sip! 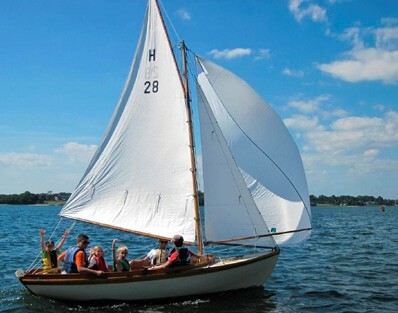 The Herreshoff Marine Museum also has a new rental program for the Herreshoff 12 ½s. These unique boats are available for rentals by qualified sailors on weekday afternoons and weekends. This is a great opportunity for those who’d like to get out on the water without the hassle of boat ownership. Summer 2015 with the Herreshoff Seamanship Program is shaping up to be a great one! Come join us for lessons, rentals or classes on our classic wooden boats and get the experience of a lifetime. There is nothing better than sailing a historic boat around Narragansett Bay on a summer day! Registration forms are available at herreshoff.org, or contact me at m.coughlin@herreshoff.org. Maria Coughlin is the Sailing Director at the Herreshoff Marine Museum.